A POWERFUL earthquake has rocked the city of Sapporo in northern Japan killing at least four people, just hours after large parts of the south of the country were battered by the biggest typhoon to hit in 25 years. The Magnitude 6.7 quake struck 70 miles south of Sapporo on the island of Hokkaido shortly after 7pm BST (3am Thursday local time), according to the US Geological Survey (USGS). Local government officials are reporting that a 82-year-old man has died after falling down the stairs in his home during the earthquake, and have confirmed that three more people passed away following the devastating tremor. Another 33 people are still missing. But public broadcaster NHK said that six people were found in cardiopulmonary arrest, a term commonly used in Japan before death is formally confirmed, and authorities expect the death toll to further rise as rescuers searched houses buried by landslides. Japan earthquake: Why are there so many every year? A further 120 people were injured, with at least 10 being taken to hospital. Japanese TV showed damaged buildings and quoted police as saying some people had been trapped in collapsed structures. The tremor, which lasted for about 20 seconds, triggered a landslide which covered homes in the rural town of Atsuma trapping residents inside. Aerial footage showed scenes of devastation, with mounds of reddish earth and toppled trees piled up at the edge of green fields, and the collapsed remains of what appeared to be houses or barns could be seen scattered around. Other scenes from the southeastern part of Sapporo showed crumbled roads and mud flowing onto a main street. 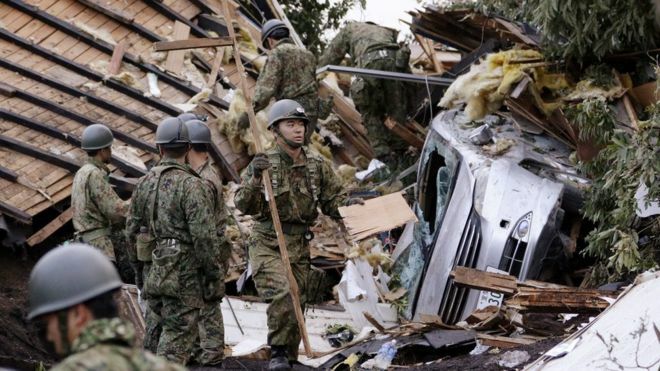 Prime Minister Shinzo Abe said officials have set up a command center to coordinate rescue efforts. The entire island lost power for the first time since Hokkaido Electric Power Co was created in 1951, as shortly after the tremor the utility conducted an emergency shutdown of all its fossil fuel-fired power plants. All trains acros the island were also halted. Scared residents took to Twitter to share testimonies of the terrrifying night. One Twitter user said: “Just woke up to a pretty damn big earthquake in Sapporo. Japan earthquake MAP: Where is Hokkaido? They are likely referring to the 5.4 magnitude aftershock which hit Hokkaido island shortly after the main earthquake. The tremor struck at an approximate depth of 25 miles, according to the Japan Meteorological Agency (JMA). The epicenter was just 16 miles from the city of Chitose, home to Hokkaido's main airport. A Twitter user named Licia said: “My friends. We just had a major #earthquake here in Japan. #Hokkaido. #Sapporo. USGS said the earthquake is not expected to generate a tsunami based on its intensity, depth and historic tsunami records. Sapporo is the capital of Hokkaido prefecture with a population of nearly two million people. Kenji Yamamoto, an official in Noborito, told public broadcaster NHK there were no reports of injuries or death in that town. Japan sits in the "Ring of Fire" arc of volcanoes and oceanic trenches that partly encircles the Pacific Basin. The island nation accounts for around 20 percent of the world's earthquakes of Magnitude 6 or greater. The earthquake comes just hours after prefectures in the south of Japan were battered by Typhoon Jebi. At least 11 people were killed and more than 450 injured in the powerful storm caused widespread damage. The cities of Osaka, Kobe and Kyoto which make up the Kansai region were some of the worst hit with violent winds of 135mph recorded. Kansai International Airport, a major travel hub for the south of Japan, remains closed and could be shut for as long as a week. Clearly not the best olace to ride out Collapse. Rescuers continued to search for survivors of a powerful earthquake on Japan's island of Hokkaido, as the death toll rose to 16. Dozens are still missing with many feared buried under rubble after the quake triggered landslides. Some 1.6 million residents across Hokkaido remain without power. The quake is the second disaster to hit Japan this week, after a deadly typhoon lashed the country's west coast. The earthquake struck early on Thursday and thousands of people spent the night in evacuation centres. The village of Atsuma was among the hardest hit, where roads and houses collapsed after huge landslides. "We've heard there are people still stuck under the mud, so we've been working around the clock but it's been difficult to rescue them," a rescue worker in Atsuma told public broadcaster NHK. One resident said: "It was horrendous. The land slid all the way down and I thought I would die. I thought my house would collapse." Could an emoji save your life during an earthquake? Prime Minister Shinzo Abe confirmed 16 people had been killed, many people injured, and 26 remained missing. "Please give your sympathy to people who spent a dark night in fear, and do everything you can to restore electricity as soon as possible," he instructed his ministers at an emergency cabinet meeting on Friday. Authorities said it could take at least one week to restore power lines to the sparsely populated countryside. With bad weather expected over the next days, officials are warning people to remain cautious and be prepared for aftershocks. The island's main airport resumed flights on Friday and train services are also scheduled to restart before the weekend. The quake also affected several manufacturers on the island. Operations at Toyota plant will be suspended until power is restored, the carmaker said. A football friendly between Japan and Chile scheduled for Friday has been called off. Japan is one of the world's most seismically active nations and accounts for around 20% of quakes worldwide of magnitude 6.0 or more. In June, a deadly tremor hit Osaka region, killing five and injuring more than 300 people. I wonder if this one was near Palloy? Nearly 400 killed and fate of 'tens to hundreds' of people unknown after magnitude 7.5 earthquake and tsunami hit Palu. Nearly 400 people have been killed after a powerful earthquake triggered a tsunami that hit Indonesia's central Sulawesi island. The national disaster agency on Saturday put the official death toll so far at 384, all of them in the tsunami-struck city of Palu, but warned the number was likely to rise. In the city - home to around 350,000 people - partially covered bodies lay on the ground near the shore, the day after tsunami waves 1.5 metres came ashore. Tomi Soetjipto, a journalist based in Indonesia's capital, Jakarta, said officials feared a "far worse" situation in the neighbouring city Donggala, home to nearly 300,000 people and closer to the epicentre of the 7.5 magnitude earthquake, which hit the area on dusk at Friday. "We haven't heard any news in terms of casualties from there, and officials are foreseeing and fearing the worst," he told Al Jazeera. The disaster agency also said there were concerns about the whereabouts of hundreds of people preparing for a beach festival due to start Friday evening. Meanwhile, hospitals in Palu were overwhelmed by the influx of injured, with many people being treated in the open air, while other survivors helped to retrieve the remains of those who died. Sutopo Purwo Nugroho, spokesman for Indonesia's disaster agency, described the damage from the quake and tsunami as "extensive" and said bodies of some victims were found trapped between rubble of collapsing buildings. "Many bodies were found along the shoreline because of the tsunami, but the numbers are still unknown," he said. Dramatic video footage filmed from the top floor of a parking ramp in Palu, nearly 80km from the quake's epicentre, showed waves of water bring down several buildings and inundate a large mosque. "I just ran when I saw the waves hitting homes on the coastline," said Palu resident Rusidanto. The quake and tsunami caused a major power outage that cut communications around Palu, and on Saturday authorities were still having difficulties coordinating rescue efforts. Road access to Palu from the east and the south were also disconnected. The city's airport remained closed after its runway and air traffic control tower was damaged in the quake but officials said they were preparing to reopen to allow aid to come in. The city, built around a narrow bay that apparently magnified the force of the tsunami waters, was strewn with debris from collapsed buildings. Seawater pooled inland and a mosque heavily damaged by the quake was half submerged. A shopping mall in the paralysed city had been reduced to a crumpled hulk. Soetjipto, the journalist based in Jakarta, said emergency supplies have been dispatched from Jakarta and other cities near Palu, but the aid has not reached affected areas because of "bad roads". "Makeshift shelters are being erected in the cities nearby. For now, the majority of people there are staying outside their homes," he added. Indonesia's meteorological and geophysics agency BMKG issued a tsunami warning after the quake, but lifted it 34 minutes later. The agency was widely criticised for not informing a tsunami had hit Palu on Saturday, though officials said waves had come within the time the warning was issued. The Palu area was hit by a less powerful quake earlier on Friday, which destroyed some houses, killed one person and injured at least 10 in Donggala, authorities said. Indonesia sits on the Pacific Ring of Fire and is regularly hit by earthquakes. In August, a series of major quakes killed over 500 people in the tourist island of Lombok and destroyed dozens of villages along its northern coast. Palu was hit by tsunami in 1927 and 1968, according to the disaster agency. 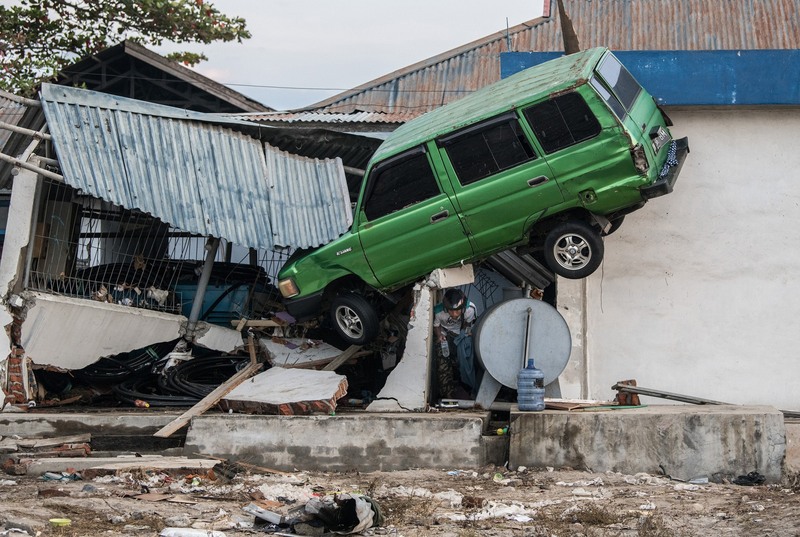 PALU, Indonesia (Reuters) - The toll from an earthquake and tsunami in Indonesia soared on Sunday to 832 confirmed dead, with authorities fearing it will only climb as rescuers struggle to reach outlying communities cut off from communications and help. Dozens of people were reported to be trapped in the rubble of two hotels and a mall in the city of Palu, which was hit by waves as high as six meters (20 feet) following the 7.5 magnitude earthquake on Friday. A young woman was pulled alive from the rubble of the Roa Roa Hotel, the news website Detik.com reported. Hotel owner Ko Jefry told Metro TV on Saturday that up to 60 people were believed trapped. Hundreds of people gathered at the mall searching for loved ones. With most of the confirmed deaths from Palu, authorities are bracing for much worse as reports filter in from outlying areas, in particular, Donggala, a region of 300,000 people north of Palu and closer to the epicenter of the quake, and two other districts. Vice President Jusuf Kalla said the toll could rise into the thousands. National disaster mitigation agency spokesman Sutopo Purwo Nugroho told a news conference the affected area was bigger than initially thought, though rescuers only had good access to one of four affected districts - Palu. “We haven’t received reports from the three other areas. Communication is still down, power is still out. We don’t know for sure what is the impact,” he said. “There are many areas where the search and rescue teams haven’t been able to reach,” Nugroho said, adding that teams needed heavy equipment to move broken concrete. Five foreigners - three French, one South Korean and one Malaysian - were among the missing, he said. The 832 fatalities included people crushed in collapsing buildings and swept to their death by tsunami waves. Donggala town has been extensively damaged, with houses swept into the sea and bodies trapped in debris, according to a Metro TV reporter on the scene. The Red Cross said it had heard nothing from the Donggala region. “This is extremely worrying,” it said in a statement. National search and rescue agency chief Muhammad Syaugi told Reuters rescuers were flying to Donggala by helicopter. Indonesia is all too familiar with deadly earthquakes and tsunamis. In 2004, a quake off Sumatra island triggered a tsunami across the Indian Ocean, killing 226,000 people in 13 countries, including more than 120,000 in Indonesia. Questions are sure to be asked why warning systems set up around the country after that disaster appear to have failed on Friday. The meteorological and geophysics agency BMKG issued a tsunami warning after the Friday quake but lifted it 34 minutes later, drawing criticism it had withdrawn it too quickly. But officials said they estimated the waves had hit while the warning was in force. Hundreds of people had gathered for a festival on Palu’s beach when the water smashed onshore at dusk. A disaster official said the tsunami traveled across the sea at speeds of 800 kph (500 mph) before striking the shore. Video footage on social media showed waves surging ashore in huge swirls of debris as people scattered. 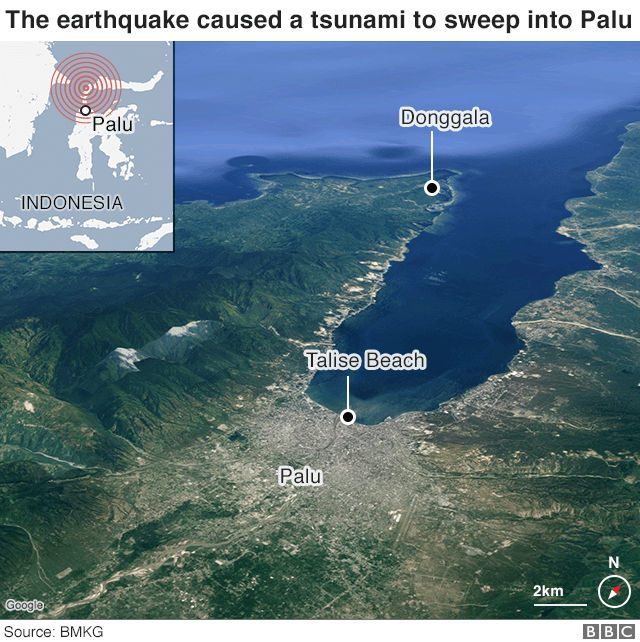 Palu is at the head of a narrow bay, about 10 km long and 2 km wide, which had “amplified” the force of the wave as it was funneled toward the city, a geophysics agency official said. Questions have been raised about what caused the tsunami, with speculation an underwater landslide was to blame. The BMKG said its closest sensor, about 200 km (125 miles) from Palu, had only recorded an “insignificant”, six-cm (2.5 inches) wave, while researchers said it was surprising the quake, which was recorded as a “strike-slip” event, when tectonic plates move horizontally against each other rather than vertically, had generated a tsunami. “It may be that the shock of the quake triggered a landslide underwater,” Abdul Muhari, who heads a tsunami research team that advises the government, told Reuters. About 16,000 displaced people were seeking shelter and needed clean water, Nugroho said, while 540 were people were injured, many getting treatment in tents set up in the open. Photos showed bodies lined up on a street on Saturday, some in bags and some with their faces covered by clothes. President Joko Widodo visited Palu on Sunday to inspect the rescue. Australian Prime Minister Scott Morrison said Indonesia had not asked for help but he had contacted Widodo overnight to offer support and deep sympathies. “It is horrifying ... If he needs our help, he’ll have it,” he told ABC TV’s Insiders program. The military has started sending in aircraft with aid from Jakarta and other cities, authorities said. Palu’s airport was damaged in the quake, but had reopened for limited commercial flights, authorities said. In August, a series of quakes killed more than 500 people on the tourist island of Lombok, hundreds of kilometers southwest of Sulawesi. Not a good day to get a suntan at the beach. At least 832 people were killed in the devastating earthquake and tsunami that hit the Indonesian island of Sulawesi, the national disaster agency says. 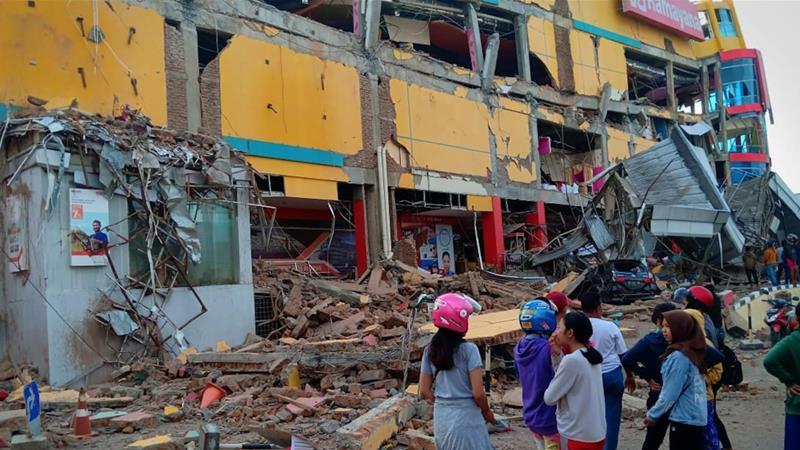 Many people were reported trapped in the rubble of buildings that collapsed in Friday's 7.5-magnitude earthquake, agency spokesman Sutopo Purwo Nugroho told a news conference. The quake triggered tsunami waves as high as 6m (20ft), he added. "What we now desperately need is heavy machinery to clear the rubble. I have my staff on the ground, but it's impossible just to rely on their strength alone to clear this," Muhammad Syaugi, head of the national search-and-rescue agency, told AFP news agency. The Red Cross estimates that more than 1.6 million people have been affected by the earthquake and tsunami which it described as a tragedy that "could get much worse". Strong aftershocks have continued to hit the island since Friday's earthquake. President Joko Widodo visited Palu to view sites affected by the disaster, including Talise Beach - the main tourist area that was badly affected by the tsunami. "I know there are many problems that need to be solved in a short time, including communications," he said. Many remain missing in the city of 335,000, some thought to be trapped in the debris of collapsed buildings. Rescue teams dug by hand to free 24 people trapped in the rubble of the Roa-Roa hotel in the city of Palu, but there are fears that dozens more remain trapped. Anxious survivors in Palu bedded down in the open air on Saturday night, heeding advice by officials not to return to their homes as a precaution. "It feels very tense," Risa Kusuma, who was with her feverish baby boy at an evacuation centre, told AFP. "Every minute an ambulance brings in bodies. Clean water is scarce. The minimarkets are looted everywhere." In Poso, a four-hour drive from Palu, supplies are running out. State-owned petrol stations have closed as they have run dry. People are queuing up at roadside stalls, buying petrol in bottles to take into the affected area and to find missing loved ones. Supermarkets have limited food left and it is difficult to find bottled water. Ermi Liana, who is travelling with our BBC team, doesn't know if her parents are alive. "They live close to a bridge that collapsed. I can't reach them by phone," she says. "I can only pray they are alive." We haven't seen any aid heading in and there is still no communication link to the town of Donggala. The 7.5 magnitude quake occurred at a shallow depth of 10km (6.2 miles) just off the central island of Sulawesi at 18:03 (10:03 GMT), triggering a tsunami, US monitors say. Many people were on the beach in Palu, preparing for a festival, and were caught when waves swept in. Video shows people screaming and fleeing in panic. When the quake hit, "we all panicked and ran out of the house," Anser Bachmid, 39, told AFP news agency. "People here need aid - food, drink, clean water. We don't know what to eat for dinner tonight." "I just ran when I saw the waves hitting homes on the coastline," Palu resident Rusidanto said. "There was no time to save ourselves," he told the Associated Press news agency. "I was squeezed into the ruins of the wall... I heard my wife cry for help but then silence. I don't know what happened to her and my child. I hope they are safe." With back and shoulder injuries, he is being treated outdoors at Palu's Army Hospital. "We need tents, medicines, medical personnel, tarpaulins, blankets and more of other things," he said. "Unfortunately the more information that we're getting, the worse the situation appears to be," charity spokesman Tom Howells told the BBC from Jakarta. Now up to 1200 Dead People! Not up to the standard of the Big Tsunami that sent over 100K to the Great Beyond though. The tsunami was triggered by a 7.5-magnitude earthquake that struck along the coastal district of Donggala on Friday. Most of the dead were found in nearby Palu, a city of nearly 300,000 where an onlooker took a video of the seawater raging ashore just after 5 p.m., local time. President Joko Widodo visited Palu on Sunday, inspecting the large-scale damage and consoling survivors. He also acknowledged problems with getting aid to the region, and urged people to be patient. Thousands of people began camping at the airport over the weekend, hoping to leave. But the airport has only been operating at partial capacity since it reopened. And as they wait for a chance to fly out, people are also enduring heat of more the 90 degrees, with little to sustain them. In addition to travel and communication problems, relief agencies say their response to the latest crisis is somewhat limited by the fact that many staff members remain deployed to Lombok — an island hundreds of miles to the south of Sulawesi, where a 6.9 magnitude earthquake struck one month ago. "Oxfam is provisionally planning a response to reach 100,000 people in Palu city and Donggala district," said Ancilla Bere, Oxfam's humanitarian manager in Indonesia. "This is likely to focus on the immediate needs such as ready-to-eat meals, water purification kits and emergency shelters." The U.S.G.S. adds, "Shallow earthquakes of this size can often have a deadly impact on nearby communities." Not that close to Palloy, or his bones, whichever that is. PALU, Indonesia -- Bright-colored body bags were placed side-by-side in a freshly dug mass grave Monday, as a hard-hit Indonesian city began burying its dead from the devastating earthquake and tsunami that killed more than 840 people and left thousands homeless. As CBS News correspondent Ben Tracy reports, the death toll was expected to rise significantly given how difficult it has been for rescuers to reach some of the hardest-hit areas, where hundreds more are feared dead. The seismic shock from the magnitude 7.5 quake triggered a tsunami nearly 20-feet-high, which came roaring over the island of Sulawesi without warning after the earthquake cut power to the tsunami alert system, reports Tracy. Until Sunday night, cries for help could be heard from the rubble of the Roa Roa Hotel in the devastated city of Palu, where most of the deaths have been confirmed thus far. Officials believe as many as 50 people could still be buried under the mountain of debris. But while some crews were still racing to save survivors on Monday, others had turned to the grim task of collecting bodies. Local Army Commander Tiopan Aritonang said 545 bodies would be brought to the newly-dug mass grave from one hospital alone, but that only some would be buried on Monday. The grave being dug in Palu will be 33 feet by 330 feet and could be enlarged if needed, said Willem Rampangilei, chief of Indonesia's National Disaster Mitigation Agency. "This must be done as soon as possible for health and religious reasons," he said. Indonesia is majority Muslim, and religious custom calls for burials soon after death, typically within one day. Local military spokesman Mohammad Thorir said the area adjacent to a public cemetery on a hill can hold as many as 1,000 bodies. All the victims, coming from local hospitals, have been photographed to help families locate where their relatives were buried. Some 1,200 inmates escaped from three detention facilities on Sulawesi after Friday's quake and tsunami, French news agency AFP reported Monday, citing a justice ministry official. AFP quoted Sri Puguh Utami as saying the inmates fled from two facilities in the hard-hit city of Palu, both of which were overcapacity, and one in Donggala. "I'm sure they escaped because they feared they would be affected by the earthquake. This is for sure a matter of life and death for the prisoners," she said. The facility in Donggala was set on fire and all 343 inmates were still on the loose, Utami said. Most of the escapees were behind bars for corruption and narcotics offenses, she added. Rescue teams evacuate a victim from the Roa-Roa Hotel in Indonesia on Sept. 30, 2018. Tracy reports that with emergency crews focused entirely on the search and rescue effort, there are no police available to try and track down the escapees. A 25-year-old woman was found alive Sunday evening in the ruins of the Roa-Roa Hotel, according to the National Search and Rescue Agency, which released photos of the her lying on a stretcher covered in a blanket. A number of other survivors were still being found and a few were being pulled from buildings in different locations. The cries from beneath the hotel, which appeared to have toppled over with its walls splintered like pickup sticks, went silent by Sunday afternoon. Metro TV showed about a dozen rescuers in orange jumpsuits climbing over debris with a stretcher carrying the body of a victim from the modest business hotel. 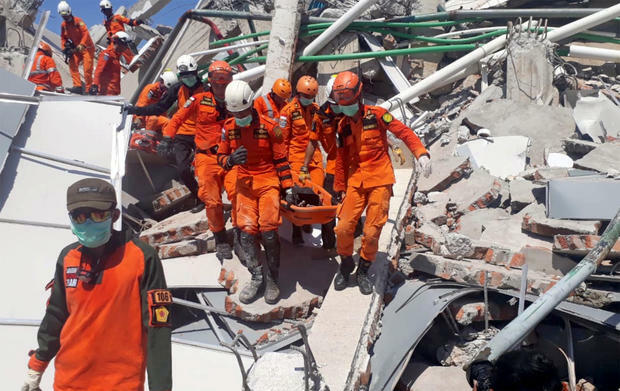 Other rescuers worked to try to free a 15-year-old girl trapped under concrete in her house in Palu after it collapsed on her family during the earthquake. Unable to move her legs under the rubble, Nurul Istikharah was trapped beside her dead mother and niece. Rescuers also tried to control water from a leaking pipe, fearing she would drown. Istikharah was unconscious during part of the effort to free her, but rescuers kept talking to her to try to keep her awake. Others offered her food and water. Indonesian President Joko "Jokowi" Widodo authorized the acceptance of international help, Thomas Lembong, chair of Indonesia's Investment Coordinating Board, tweeted Monday morning. It wasn't immediately clear what type of help was approved, but the stricken areas needed medical supplies, fuel, fresh water and experts. "We will send food today, as much as possible with several aircraft," he told journalists in the capital, Jakarta, adding a supply of fuel was also set to arrive. In Donggala, the site closest to the earthquake's epicenter, aerial footage on Metro TV showed the sugary blond sands of beaches swept out to sea, along with some buildings. Some structures in the town were severely damaged, with plywood walls shredded and chunks of concrete scattered on the pavement. Much of the damage, however, appeared limited to the waterfront. Palu, which has more than 380,000 people, was strewn with debris from the earthquake and tsunami. A heavily damaged mosque was half-submerged and a shopping mall was reduced to a crumpled hulk. 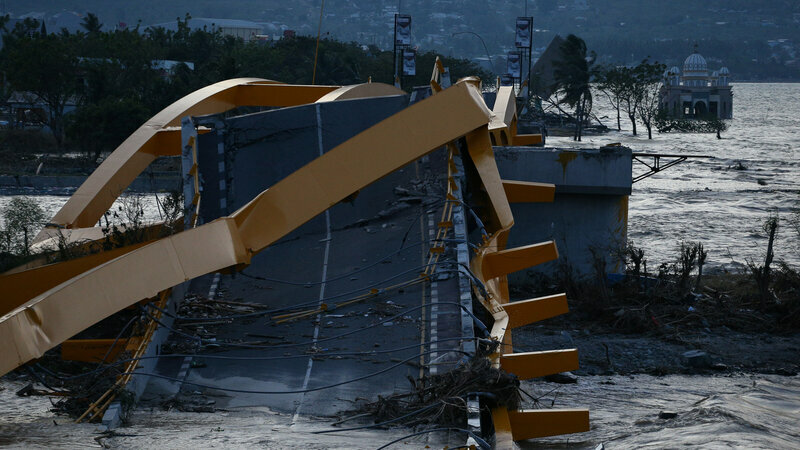 A large bridge with yellow arches had collapsed. The city is built around a narrow bay that apparently magnified the force of the tsunami as the waves raced into the tight inlet. In Palu, residents said dozens of people could still be buried in their homes. With hundreds injured, earthquake-damaged hospitals were overwhelmed. Nugroho said 61 foreigners were in Palu at the time of the disaster. Most were accounted for, but one South Korean was believed to be trapped in the Roa-Roa Hotel, while three others from France and one from Malaysia were missing. The disaster agency has said that essential aircraft could land at Palu's airport, though AirNav, which oversees aircraft navigation, said the runway was cracked and the control tower damaged. The earthquake/tsunami was the latest natural disaster to hit Indonesia, which is frequently struck by earthquakes, volcanic eruptions and tsunamis because of its location on the "Ring of Fire," an arc of volcanoes and fault lines in the Pacific Basin. In December 2004, a massive magnitude 9.1 earthquake off Sumatra island in western Indonesia triggered a tsunami that killed 230,000 people in a dozen countries. More recently, a powerful quake on the island of Lombok killed 505 people in August. Indonesia is a vast archipelago of more than 17,000 islands home to 260 million people. Roads and infrastructure are poor in many areas, making access difficult in the best of conditions. We just had a good shaker here. This one was enough to get me out of my chair hobbling over to the door to the back porch. It took me so long to get there, by the time I got to the door the quake was over. If we ever get a real big one here, I'm a goner. I'll report more when I get details on the magnitude and where the epicenter was.